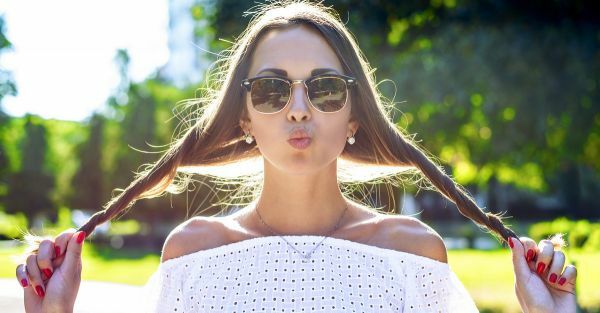 7 Simple Fashion Tricks To Avoid ‘Sweaty’ Problems In Summer! We’re human. When it starts getting hot, we start sweating. Summer and sweat related issues have been a concern for many women. It is but a natural process our bodies have to cool down and keep the heat at bay...but we all know how sweat stains can ruin your outfits. To make sure this doesn’t keep you from looking your best, here are 7 things you should do during the summer! Cotton is a lightweight fabric that is airy and does not stick to your skin. It was especially designed to keep the harsh summer heat bay. Cotton also dries fast and does not retain moisture. Opt for light cotton dresses and shirts to keep you cool on a scorching hot summer day. Bonus: since it allows sweat to dry off completely, you have to worry a lot less about body odour issues. It is important to pick colours that don’t light up sweat stains and make them prominently visible. For instance, on jet black, even if the sweat has dried, residue can show up as a whitish patch. On a pale pink, you might see a yellowish sweat stain. Mid-light (like coral, bright yellow, etc.) to-medium-dark (like brown, dark grey, etc.) fabrics work best to hide sweat stains. A bright white, oddly, does an equally amazing job. Another way to avoid sweat stains altogether is by wearing tops and dresses that let those sweaty areas breathe. Wear a cute halter top that gives your armpits enough air and room to breathe. These items were created for the summer, so you might as well make the most of them. Sweat stains are more visible on a solid coloured top than one which has an interesting print on it. Choose a top with some interesting designs and prints like an abstract one, or go for one with a houndstooth print. The print takes the focus away from the problem areas. Wearing an extra layer will keep the sweat stains hidden. It will block the sweat from getting absorbed by the outer layer. Make sure that the inner is not thick, though - it should be very light so that it doesn’t make you sweat more! Summer is definitely not the right time to wear a trendy viscose bodycon dress or tight leather pants. Wear loose fitted clothes that do not suffocate your skin. Wearing tight garments will not only make you feel hotter and sweat more, but they can also lead to chafing. Not cool! In times of dire need, when you’re wearing a fab dress to a party and you don’t want sweat to spoil your look, then sweat shields are your bestie. Make sure to change the shield as often as possible as it may retain too much moisture causing heat rashes. There are lot of different sizes and designs available in the market, like this one here (Rs 125)! Images: Shutterstock HAVE A STORY IDEA FOR POPxo? If you want to hear about it, we can write about it! Just tell us your idea here! MUST-READ: 10 Fashion Mistakes To Avoid In The Summer! MUST-READ: “White Bra Under White Shirt?” All Your Fashion Doubts Cleared!